A class-action lawsuit has been filed against Ford Motor Co. claiming that the MyFord Touch and MyLincoln infotainment systems are defective. On Monday, the Center for Defensive Driving (CDD) filed a 41-page lawsuit on behalf of Ford and Lincoln owners in the U.S. District Court for the Central District of California alleging that the MyFord Touch and MyLincoln infotainment systems do not work properly. The suit also cites the MyMercury Touch system, but such a system has never existed. In fact, Ford introduced the infotainment system involved in the suit after the Mercury brand was discontinued. In addition to arguing that Ford’s infotainment system fails to work properly, the lawsuit goes as far as claiming that the system has been an “unmitigated disaster” for the automaker since it was introduced in 2011. The grievance cites specific examples of the system freezing up, blacking out, failing to respond to touch commands, failing to connect with user’s mobile devices, and failing to work at all. The complaint also alleges that Ford knew about the problems and failed to disclose them to the public. With respect to Ford failing to tell the public about MyFord's problems, Ford CEO Alan Mulally acknowledged the system’s shortcomings in 2011. The automaker also performed software upgrades on affected infotainment systems last year. Ford has also issued multiple technical service bulletins addressing problems with the MyFord Touch and MyLincoln Touch systems. The lawsuit also cites a 2012 J.D. 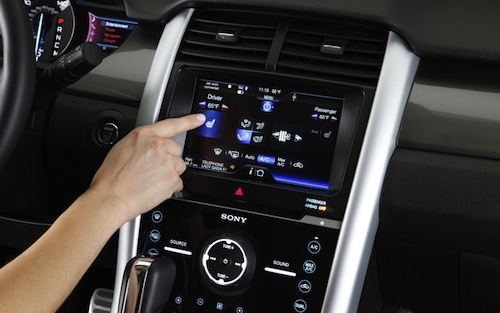 Power and Associates Study, which contributed Ford’s decline in the quality rankings to the MyFord Touch system. Based on MyFord complaints, Ford dropped four spots in J.D. 's Initial Quality Study rankings to 27th overall. “It’s not that the problem is getting worse, it’s becoming more prevalent because they are introducing more vehicles with MyFord Touch,” said David Sargent, vice president of global automotive at J.D. Power and Associates in a New York Times interview. Interestingly, Ford is a founding member of the CDD, who filed the lawsuit. In fact, Ford’s logo is prominently featured on the group’s website. According to the CDD’s website, the purpose of the group is to provide educational presentations to the public on defensive driving. Three volunteer directors and an all-volunteer staff run the CDD. The suit does not include any monetary claims, but does state that a figure will soon be determined. Aside from monetary compensation, the plaintiffs are requesting that Ford institute a recall or free replacement program. Click HERE to read The Center for Defensive Driving v. Ford Motor Company.